Veterinary Integrative Center has a fully equipped surgical suite and can offer a range of soft tissue surgical procedures, including spays and neuters, mass removals, laceration and wound repairs, bladder stone removal, intestinal surgeries, cesarian sections, minor ocular and auricular conditions, and other procedures. Utilizing the services of a mobile veterinary surgeon or referral to a surgical specialty facility may be necessary for orthopedic or more complicated soft tissue surgeries. Cosmetic surgeries such as ear cropping, tail docking, and feline declawing are not offered unless the surgery clearly provides medical benefit to the pet. 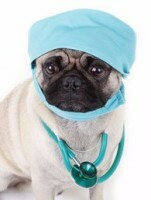 Our anesthetic protocol is tailored to each pet's specific needs. Factors such as the size and age of the patient, concurrent medical conditions, nature of the surgical procedure, and duration of the procedure are all considered when generating each individual protocol. Bloodwork, x - rays and other diagnostic tests may be indicated prior to surgery. The patient's vitals, including heart and respiratory rate, blood pressure and temperature are monitored continuously during the procedure by the trained technical staff. All of these precautions and steps taken are necessary to help to ensure the highest safety for your pet. Please call us to obtain more information about our surgical services. The staff will be more than happy to anwer your questions or provide you with the proper referral so your pet can receive the best possible care.